McKenna is now three months old! We are through the newborn stage. To celebrate, I thought I would share some tips. With each child, I have learned little things that can just make life easier during the postpartum period. This time period can be a little bumpy, so I wanted to share things I have found smooth the road. As always, please share any tips you have found work for you also! A good friend of mine once commented on how long a trip to the bathroom took her after she had her baby. I have found this to be true, also. This can be a bit annoying, especially at night. That extra long bathroom trip is eating into your sleeping minutes! Here are some tips to make the bathroom experience easier. Easy Access: Keep all of the things you need close to the toilet. I know this isn’t a glamourouse conversation, but it is a real one. What might you need? Some ideas are any medicines you use such as Tucks Pads (witch hazel) and dibucaine ointment. I keep the two I am using on the counter next to the toilet and back-ups in a drawer next to the toilet. If you don’t have a counter close by, put it on the back of the toilet. If you don’t have a drawer close by, pay attention and put a back-up next to the one you are using when you get close to running out. Another idea are your pads. Also, you might want a change of underwear for when the pair you are wearing gets dirty. Another idea is a bottle of water for cleaning (used if you have a vaginal delivery). Water Bottles: If you had a vaginal delivery, chances are the hospital suggested you use a squirt bottle with water in it to cleanse yourself rather than wiping. You fill the bottle with warm water. The trouble is that sometimes a bowel movement comes when you don’t expect it and you need more water! This time around, I kept two bottles available. I kept one filled at all times for ’emergencies’ and then filled the other one each time I went in. That way I knew I would always have enough water. Extra PJs and Bedding: Babies often leak through their diaper. When this happens, you of course need to change their pajamas and often times bedding if baby was in bed when it happened. It is the worst when this happens at night. While baby is a young newborn and I am still getting used to the location of things, I like to set out an extra pair of pajamas on the changing table. That way if the extra pajamas are needed, they are ready and waiting and I am not fumbling through the drawers at 2 AM trying to remember which drawer holds the pajamas. Water: If you are nursing, you are going to want a nice big glass (or jug) of water close by so you can quench your thirst. Burp Rag: Keep a burp rag close by for those times baby spits up. Medicines/Creams: Keep your Lansinoh, gas drops, etc. close by. Also, keep any pain medication you might be taking close by. Nightlight: Put a nightlight in strategic places if needed. I am one who can get to be fully awake quite quickly and easily. Full light will wake me up. I keep a nightlight in places I need some light but don’t want to turn the light on and wake myself up. You also don’t want light to wake up your baby. Nuring Pads: I also set nursing pads out on my night stand each night before I go to bed. For Your EmotionsWe all know what an emotional roller coaster the post-partum period is. Here are some things I have found help (see also the post Emotions). Sleep: I always hate to read this advice for new moms! Get lots of sleep. Sigh. Don’t we wish! But there are things you can do to get those extra Zzzz’s you are missing out on. If this is yours first baby, you have more luxury of sleeping when baby is sleeping. Take advantage of that. You can go right back to sleep after the first feeding of the day. You can take an afternoon nap. You can take a nap whenever baby is napping! When Brayden was a baby, I did not take advantage of that. With older children, though, you have to work around them. Go to bed early. When Kaitlyn was a baby, I went to bed after her 8:30 PM feeding (she didn’t do a dreamfeed as a newborn). Sometimes in McKenna’s early weeks, I went to bed around 9:00 PM and set my alarm to wake for the dreamfeed. It gave me some extra hours to sleep that night. Chances are if you have older children, the only other time of day you will be able to sleep is in the afternoon when naps line up. If you are not a napper (like me) and hate to sleep because you are thinking of all the things you need to be getting done, make some rules for yourself. One rule I had with Kaitlyn was that I had to take a nap every day for the first month of her life. With McKenna, I wasn’t as tired. I did that for the first week or two, but then I made the rule that if I got fewer than 7 hours of sleep the night before, I had to nap. Otherwise, it was optional. Make rules that work for you and your sleep needs. Eat Right: Eat healthy foods that will give you energy long term. Avoid the sugar loaded foods that put you on a temporary high and then send you crashing down. You don’t need any more opportunities to crash right now. Walks: The Baby Whisperer often states new moms should take long walks each day. I remember one day when McKenna was 3 weeks old. I was feeling particularly down that day. We went for a family walk–I didn’t feel like it but my husband made me. After we had walked a couple of blocks, I started to feel really good! It cleared my mind and it moved my body. I was better able to put things into perspective. Get Out: Along those lines, get out of the house every so often. A trip to the grocery store can be thrilling! If you can, run errands when your spouse is home and can stay with the baby and/or older children. Some time a lone is nice. It is also nice to take your older children with you and have time to focus on them without worrying about the baby. Or you can take the baby and not worry about the older kids! Mix it up. Know Yourself–Your Post-Partum Self: Get to know yourself and your emotional needs. They are likely different from your normal self. This is the new you for however long the hormones make you emotional. Communicate: Once you know yourself, communicate your needs to your spouse. When Brayden was a baby, I handled my emotions differently and it took my husband and I several weeks to recognize that. Now, my husband knows post-partum me better than I do and he forces me to do things that will help me–hence the walks and running errands alone. Exercise: Once you get the clear from your doctor, exercise! It can be hard to find time to exercise, but make it a priority. It is important to take care of yourself. You will have more energy, which makes for a more fun Mom. I recently started running with a friend and I am amazed at how much happier it makes me. Consult: If your emotions are really spiraling and/or you just feel like something is off, talk to your doctor about it. Get help. You may or may not need help, but talking to your doctor will help you to know. She sees lots of pregnant women and she knows the signs. If you are like me, the chores that need to happen around the house start to really eat at you. This is one reason I have a hard time napping. Break It Down: I have talked about this in the past. I have a “chore” for each day of the week. So Monday is laundry day. Tuesday is dusting, etc. You could do it like that or take one room a day. Monday is the family room. Tuesday is the master bedroom, etc. I also have the things that must be done every day (dishes!). This way, the tasks and goals are small. Make Lists: When your brain isn’t working well (a definite fact of life during post-partum time), lists are great. They help you keep things straight and help you remember what you need to do. I often find that while I am nursing, I think of all the things I need to get done. When I am free, I seem to forget. I have started keeping a paper and pen where I nurse so I can write the things down that I need to get done. Get Help: Get your husband to help. Ask your Mom for help. When your friend offers to help, accept it. Take the help that you can. If you can afford it, hire a cleaning service! That would be nice. Get Over It: HA! I need to write that to myself on a daily basis. If you think keeping a house clean is a challenge with one baby, just wait until you have a preschooler, toddler, and a baby! I can be *slightly* OCD, so I try to really keep things in perspective. At the end of the day, I can clean up. At the end of the day, I cannot spend time playing with my kids or teaching Brayden in schooltime. Prioritize: Prioritize the things you need/want to get done each day. Do the most important first. That way if/when you can’t complete it all, you at least have the most pressing things done. These are things that are time sensitive or things that will just wear on you if you don’t do it. Make Small Goals: Time is just not free flowing when you have a newborn. Even with an easy newborn, you don’t have as much time. This is even more true when you have other children to take care of. I spend at least 7-8 hours each day just on McKenna! Feeding, bathing, dressing, playing with, etc. That is to say nothing of the time spent obsessing over her schedule :). Then I have the other two children and a husband! You have to just accept that you will not be able to get as much done. Over time, you learn to be more efficient and you also get more time as your baby gets older. My mother-in-law always says that the most efficient people in the world are young mothers. She says now that she is an empty-nester, she takes her time doing things. She has the whole day to get things done but she doesn’t get as much done as she did with four small children at home. Shower: For me, this one could also go under “emotions.” I absolutely must shower every day. I feel so much more rejuvenated and refreshed. I get completely ready, down to my jewelry. It just makes me feel better. I know some people prefer to stay in their PJs all day. If that is you, go for it! Figure out what makes you feel better and do that. Enjoy Nursing: When I nurse, I like to read a book. For the last year and a half or so, I have been buying books and saving them for the next nursing baby period. That way I would have books I was looking forward to reading 🙂 It helps make the time go by faster. I had a friend that watched movies while she nursed her twins. I hate sitting still, so reading is a good thing for me to do that makes me relax and enjoy nursing. Host a Party: Having friends/family over helps you in several ways. One is it gives you something other than the baby to stress out about :). Another is you are serving people and that always makes you feel better. You also have a taste of “real life” and it just gives you that social boost you need. Do Hobbies: Scrapbook, sew, listen to music, dance, garden, cook…do whatever it is that makes you you. You won’t have a lot of time for them, but you will have some. If this is your first child and your baby is easy, you might have a lot of time. Just don’t become so wrapped up in your baby that you lose yourself. You want to maintain your identity and your personal interests. There is nothing wrong with taking care of yourself, also. It in no way takes away from your baby. It only benefits baby. Baby will have a happy, confident mom! Scale Back: You can’t do all that you did before baby. You can’t attend every family function. You can’t go to every social gathering. You can’t clean the house from top to bottom every weekend. You can’t run errands at the drop of a hat. You must scale back. You must learn to say no. It isn’t forever. The day will come when you can start attending things as often as you would like. Our families know that when we have a new baby, we just don’t go to everything. They now expect that. When go when we can. We stay home when we need to. When you become a parent, you have to change your lifestyle. You create a family. You can’t tote baby around behind you as you refuse to give up your fun. That isn’t responsible. But that doesn’t mean you have to lock yourself up in your house forever, either. Again, this is a family. Baby doesn’t rule all. 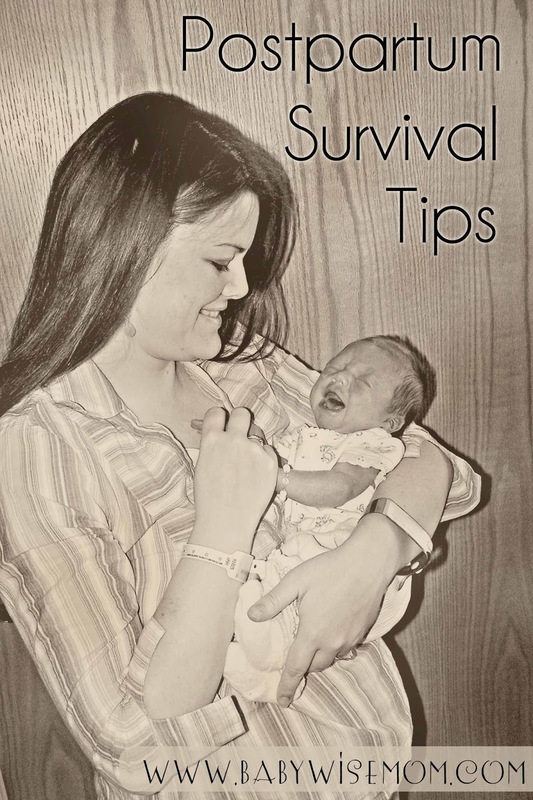 Those are some tips I have for surviving and adjusting during the post-partum period. I am sure many of you have great tips, also, so please share! Great post! Although my son is 13 months old already, I still remember the postpartum days/weeks/months very clearly. You have some excellent points. And I completely understand about showering and getting yourself ready everyday. It may not happen first thing in the morning every day, but it does happen everyday. It makes moving forward and focusing on your day just that much easier! And congrats on finishing the "4th trimester" with McKenna! I really loved the first three months! One thing that helped me is I kept everything in a little carry-basket. I kept my water bottle, any wipes, pads, nose drops, gas drops, a couple pads, burp cloth, Lansinoh, etc. Then I could carry that and baby down with me in the morning and not have to worry about anything being upstairs when my husband wasn't home. At night I would just carry it back upstairs with me! The worst was when I was upstairs and realized the water bottle was at the toilet downstairs! This way I always had everything on the floor I was on! I am now entering the 3rd month of my 2nd child's life. This time I realized that for me your "breaking it down" idea really influenced my emotions. I had to set 1 or 2 small chores to accomplish in order to feel like I did something. My husband was quick to remind me that tidying the entire house or doing all the laundry was not a good goal for me. I had to have small goals or my emotions would get the best of me and I'd start feeling down. I love having a real list and crossing off those 1 or 2 things. Wow Valerie this is an awesome post!!! I kind of wish I hadn't had to figure out so much of that on my own. Thought I would just mention, One thing I found really useful was to have crib set up so that I had a liner then a sheet then another liner then another sheet. That way if my daughter leaked in the middle of the night I didn't have to turn on the light and remake the crib bedding, I could just pull off the top 2 layers (often in the dark!) and she was good to go!! Great tips! I only have one to add and that is for those who have a hard time sleeping because the brain won't quiet down. Keep a notebook & pen nearby and write down the things you can't get your mind off of, then you can refer to it later without the concern that you'll forget. When my first was born, we lived in a small one bedroom apartment. Nothing was ever too far away because there just wasn't a lot of space. We've (thankfully) moved to a larger place with two floors and these are excellent tips for when #2 comes! I think this is my favorite post! I have three children and my last two were boys and I had PPD with both. My youngest son is only 5 months old and I vividly remember those first two weeks. They were the hardest! Getting SUNSHINE is very theraputic and I drank lots of vitamin D milk too. Useful post! I'll be recommending this to all the pregnant women I know 🙂 I completely agree with everything and I used many of the same tactics to survive the postpartum period. Here's a few addition things that I needed while nursing: 1) extra clean bras and shirts! I can't even count how many times I would unsnap my bra to nurse only to discover I had leaked everywhere, ugh! It's helpful to keep a t-shirt and extra bra nearby with the spare outfit for the baby.2) A burp cloth, I always kept those nearby both to clean up any leaks and in case Tobias spit up after eating. I stuff them everywhere 🙂 3) I also kept my boppy pillow beside the bed so I could pull it up without moving to nurse, I really depended on it the first couple weeks since nursing is a bit awkward at first.4) the remote, lol! Sounds silly, but I relied on tv to keep me awake during the nighttime feedings and so often I'd find myself stranded with a baby at the breast and no way to reach the remote, then I'd have to call to my husband to get it for me. When you keep a glass of water in your area where you will be nursing, make sure you put a straw in it! It is very hard to hold the baby in position, hold your breast, and tip a glass back to drink without spilling! Use a straw – it is much easier!!!! My husband always brought me a glass of water with a straw in it when I sat down with baby to nurse. How sweet! One more thing: While your keeping a log of poopy diapers, keep a log for yourself of any pain medications or any type of meds you are taking, so you don't accidentally take too many. In your sleep deprived new mommy state, it is easy to forget what time you took that last pill! So write it down when you take your meds! If you have an iPhone there is an application called "blogger" by Nerd Town. That was a life saver for me. Whenever I sat down to nurse I would open the app and press the start button. You can mark left, right, or bottle. Then press stop. It keeps a log for you and you can look at the summaries so at any time I knew how long I feed on each side and which side last. Also it keeps up with dirty diapers which is necessary the first week or so. There are other features that I didn't use so much like burping/spit up and wake/sleep. My phone has really been helpful. I also have a docking station on a little table next to my recliner I nurse in. It helps for charging. Mine can play the radio also which is nice if I don't want to listen to the music on your iPhone. I love this post!! I haven't started BW yet with my twins (I work full time & haven't had a chance to finish the book), but we are starting a BWish schedule starting tomorrow (I have 4 days off in a row to work with them) and will add in the other things (CIO) once they get more accustomed to the schedule. They are 17wks old…and are now having more good days than bad with their colic. Here are my tips for the postpartum period…..1– my preemies would never latch…so I had to pump and bottle feed my breast milk. That is until I had major supply issues and dried up at 10wks. I had a "pumping station" which had all my supplies and hubby installed a flat screen TV so I could watch TV while I pumped. It helped (supply wise) to be near the kiddos when I pumped, but I would get bored just being in the nursery..so the TV was great. We also use the TV now (it plays CDs and DVDs) to play the white noise CD we received when we ordered our Happiest Baby on the Block DVD combo. The CD works pretty good to calm the little ones.2– get granola bars or other handy food items to eat while pumping/feeding. I never seemed to have the time to eat enough…and lost so much weight which of course affected my supply…so this really helped me. 3– for middle of the night diaper accidents or throw up….I suggest these sheets called the ultimate crib sheet (http://www.toysrus.com/product/index.jsp?productId=3188798). It is a mattress pad, and sheet all in one and just snaps onto the side of the crib. Don't know about your bedding, but my sheets are so tight around my mattress…it is a super pain to try and change the sheet…especially at 2am. These are a little expensive, but are a lifesaver. 4– make a chore list of all the things that have to get done everyday (wash bottles, feed animals, empty litter box, take out trash, etc. ), and other chores that need to be less often and check them off as you do them. Found that with my husband and friends/family that would come over…they wanted to do things to help, but didn't know what needed to be done. This list lets them see what needs to be done and there is no awkwardness in you asking them to do something or vice versa. 5– try to dress up and do your hair/make-up at least once a week or every other week. It is hard to force yourself to do this (always seemed like a waste of time for me), but I always felt so much better…sexier…after doing it. Most of the time I wouldn't even be going anywhere…just wanted to feel put together…even when I had only had 2 hours of sleep the night before. 🙂 Other days I was lucky to get a shower…let alone blow my hair dry, etc.6— double/triple recipes and freeze the leftovers. The crock pot and I became fast friends during my post-partum days. I didn't have time to cook a lot of meals…so I would triple the recipe and put the left overs in the freezer to be eaten in the following weeks. After a few times of doing this…I had a pretty good stash of thaw-&-eat healthy meals. I also second the communication. I wasn't really talking to my hubby about my emotions or frustrations and I lost it one night. I had only been geetting 2-3 hrs of sleep a night for weeks and I was exhausted. My twins were both colicky and they would cry non-stop (12+hrs a day). Add a breast infection to the mix and I couldn't take it anymore. I had a mini break-down one night at 4am. My husband didn't realize how tired I was (duh..but whatever) and had no idea my PPD was so bad (and it was). After that night we were much better about communicating and even though I wasn't getting any more sleep and the kids were just as fussy…..he helped me see the humor in the situation and it helped to laugh. This IS an awesome post that I am going to send to my pregnant friends who are expecting baby #1. I just had baby #1 in April and one tip that our childbirth instructor said to us in regards to the changing area was to take some cotton balls and put them in a small food storage container (clean, of course!) and to pour rubbing alcohol over them to use to clean the cord area. Sure does save time and hassle when you are changing in the middle of the night. Also for a circumcised boy, use the tube vaseline instead of the tub of it. MUCH less messy. I also agree to keep lots of water in the nursing area, and to make sure the nursing area is soft, esp if you have delivered vaginally. My cousin-in-law has a foam donut pillow that she loans to new moms and it saved me a lot of pain. We all sign the name and birthdate of our little ones on the bottom of it. Very sweet. Oh, and one more thing…a friend of mine called the week before I was due (she lives 2 hours away) and suggested that she set up a meal schedule for me. I wasnt sure about that but she asked for email addresses of friends who might want to bring dinner. Then, she set up a schedule on foodtidings.com and emailed everyone. We had meals 3 times a week for a MONTH. It was awesome. She was not able to bring a meal b/c of how far she lives, but just organizing this was huge for us. I plan to do it for friends for sure. What a gift! Thanks Wenona! I am just loving McKenna's age right now. Katy, that is a most excellent idea! I don't know why I never thought of that. My solution is just to have two of everything, but your idea is much more economical! SmlTwnLdy, it sounds like you have a great husband 🙂 Mine does the same thing. Managable goals definitely make you feel like you are contributing to the household! Meg, thanks! That is another really good idea! I haven't ever thought of that. See, if you put everyone's heads together, we can solve any problem! That is a good idea Kristin. I keep paper and pen where I nurse because I always thing of all the things I should be doing while I am nursing. Keeping it by the bed is a good idea too. Thanks Em! The sunshine really does make a world of difference. Amanda, good idea for the extra clothes for mom. When Brayden was 3 weeks old, we went to my in-laws. I leaked everywhere. My shirt was literally dripping! And I had no extra clothes. Ugh.Good with the burp cloth, too. I keep them shoved in little spots. The boppy–I use it for nursing the entire time! Unless I am not home. But it is much more comfy. And I wish I needed the TV to keep me awake! I have such a hard time falling back asleep. Redheads, good point. I keep a mug in my nursing spot that has a straw with it. Good idea with the meds log too! Jenn, thanks for the tips! It is good to get tips from a twins perspective. Yeah, I hate changing the sheets–so much that I always ask DH to do it! An idea I use for spit up is I lay a burp rag under where the head goes (it is flannel and totally flat). Then I just change the burp rag and not the sheet. A lot of people have shared the ultimate sheet thing, though, and I have it on my wishlist of things to get! It sounds great.lol about the "duh." I think it is hard to know unless you are there. Sarah, so true about the vaseline. I remember that. That is a great idea by your friend. Where I live, people bring in meals forever–but you are slammed with them in the first week for sure (not that I am complaining). We always have leftovers, so the three a week is a good idea because you have enough leftovers to get you a couple more meals…then throw in an easy meal by you once a week and you are golden!